Let me preface this post by saying that I wish I had written James Michael’s birth story soon after he was born. But admittedly, things were much different right after his birth and I was hypersensitive to everything he did like many new moms, so capturing special moments that first week were put by the wayside as I learned how to be a mom. This go round, I’m a lot more laid back, experienced and—knock on wood—everything so far has been much easier. When I went to the OB for my regular 36 week appointment, my midwife informed me that I had not started dilating. I had expected this and was quite all right with it since I still had a month until my due date. I did find out that Beau was head down, which was more of what I was concerned about anyway. The next week at my 37 week appointment, I was surprised to learn I was 3 cm dilated. With James Michael, I think I was 1.5 cm at his 39 week appointment, so I wasn’t expecting to be this far along at 37 weeks. My midwife told me to try to take it easy for the next week because she didn’t want me to go into labor before my next appointment. Of course, I didn’t want to go into labor before 38 weeks along either. So I tried to take it easy as possible with an 18 month old. We played on the back deck with water toys several nights so I could sit down a few minutes instead of running around like normal. We went on a few short stroller walks as well. But that’s about as easy as it can get for a roving toddler. After I learned I was 3 cm, I noticed some changes in my body. I had increased Braxton Hicks, didn’t sleep well at night and was generally more tired. I was also nauseous a bit and my body was cleaning itself out. I wondered if I was just looking more into things since I knew I was 3 cm along, because a few days after my appointment I felt normal again. I went to work Monday and Tuesday to finish up my last two days before starting my leave two weeks before my due date. I had planned a pre-Beau productivity wish list and was excited to have some time to get some small house projects complete and freezer meals made. 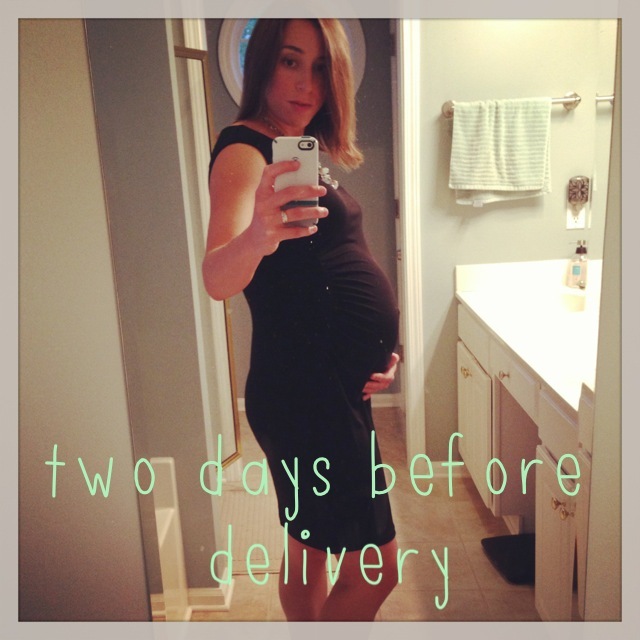 Tuesday, my last day in the office, I went to my final chiropractor appointment while pregnant during my lunch break. It took several tries, but my chiro managed to unjam my right hip, which has historically had issues with jamming. I was so happy I went because I knew a jammed hip would not be helpful during labor. Wednesday morning I woke up, excited to start my leave and had a day of fun planned—splash parks, picnic, playgrounds, etc.—with my sister and James Michael. But my first stop was my 38 week OB appointment that morning. My sister took JM on an errand while I went in for my quick check. The week before, my midwife had mentioned very small possibility that I could come back at 38 weeks and be 5 or 6 cm dilated and not even know it. If that happened, she would likely admit me that day. To me, it seemed totally ludicrous that someone would be dilated that far and not realize she is in labor. So I didn’t think much of it but I did throw mine and JM’s bags into my trunk just to be safe. Plus, it would be one less thing to think about when the time came. My eyes got big and I’m pretty sure my jaw hit the floor. How in the world could I have been that far along and not realized it?